Katie Canales/Business InsiderTne teeny-tiny Surface Go has a small keyboard that takes some getting used to. Microsoft’s Surface Go is here, a teeny-tiny $US399 laptop/tablet hybrid. Generally speaking, it’s pretty good, and sports a nifty design – the keyboard takes some getting used to, but once you adjust, it’s comfortable and responsive. Microsoft is now selling the Surface Go – a teeny-tiny Windows 10 computer with a ten-inch display, that will start at $US399. I’ve been using one as my main computer for a few days now. That’s not enough time to do a full-fledged review, but my first impressions are generally positive: This thing is a versatile little device with a lot going for it, especially when you compare it to Apple’s MacBooks or the iPad Pro. You should know, though, that the Surface Go comes with some trade-offs that could make you pause. Really, the Surface Go is just a shrunken-down version of Microsoft’s flagship Surface Pro. Just like its bigger brother, the Surface Go is a tablet with a kickstand, designed to be used with Microsoft’s removable Type Cover keyboards. With the keyboard on, and the kickstand out, it becomes a versatile, touchscreen Windows laptop. However, it also inherits the Surface Pro’s often-frustrating pricing scheme. 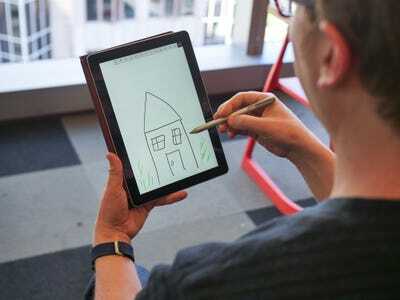 The $US399 price tag is only for the tablet itself, and you’ll need to pay $US99 or more for a Type Cover. Technically, you don’t need a Type Cover to use the Surface Go, but without one, it’s mostly just another tablet. Ultimately, the Surface Go is pretty neat. Like Microsoft’s other, excellent Surface devices, the Go runs full Windows software, unlike the iPad, which is limited to Apple’s App Store. But it’s a touchscreen tablet, which makes it more versatile than a Mac. And because it’s so tiny, it’s easy to stash away and whisk around anywhere. With that said, the Surface Go is a marvel of design. The screen is nice and bright, and it runs quietly and without getting too hot. At 1.15 pounds for the Surface Go tablet itself, and a smidge more with the keyboard, it’s a little heavier than most iPads, but lighter than the lightest Apple MacBook. The smaller keyboard took some getting used to – I spent the first few days feeling like I had massive gorilla hands, and kept making typos as I tripped over my own fingers. A few days in, though, and typing on the Go feels far more natural. I’ve come to appreciate how Microsoft got the keys so quiet, while maintaining a nice “clicky” feel. Katie Canales/Business InsiderIt’s also a fully-functional tablet, and works with the Surface Pen (not included). It’s been kind of wonderful, even in this short span, to have a super-light, super-portable laptop that can just be folded up and carried snugly under your arm. It also supports the Surface Pen for sketching and note-taking, though one isn’t included. And it supports Windows Hello facial recognition for quick login. One sort of mixed blessing is that it doesn’t have any regular USB ports, which puts it on a par with Apple’s iPad line. However, it does have a single USB-C jack, plus a Surface Connect charge port, a headphone jack, and a mini-SD card slot to expand its storage. It means that, unless you’ve already invested in devices that support the new USB-C standard, you’ll need a lot of new cables, or at least adapters, to hook into the Surface Go. It’s better than nothing, especially in a tablet of this size, and you can even use USB-C to charge it up. But it’s also a little frustrating that there’s no other option. The Surface Go comes with Windows 10 in so-called S Mode. The idea with S Mode is that you get better battery life and more reliable performance, with the trade-off that it can only run software from the official Microsoft app store. That means yes to Microsoft Office, Minecraft, and even iTunes…but no Google Chrome, Steam, or Fortnite. You can go from S Mode to plain old Windows 10 quickly and for free, but it’s a one-way switch and there’s no going back once you do. Given that this is how Microsoft clearly intended the Surface Go to be used, I’ve committed to using S Mode for at least a while longer – meaning I’m using the Microsoft Edge browser, all the time. So as I make my next complaint, keep in mind that I’m using Microsoft’s recommended browser, on Microsoft’s recommended Windows 10 settings. 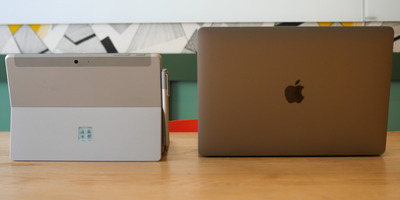 Katie Canales/Business InsiderIt’s considerably smaller than 13-inch laptops like the MacBook Pro pictured here. This sluggish performance doesn’t happen all the time, but there seems to be an upper limit of tabs you can have open before things start to slow down. I’m trying to keep my expectations reasonable. 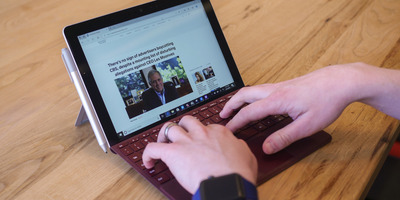 The Surface Go is smaller, lighter, and packs a less-powerful Intel Pentium chip than higher-end laptops like Apple’s MacBook Pro or the Surface Pro. Still, when you compare it to the always-on, snappy performance of an iPad, its closest rival in terms of price, it’s a big disappointment. I’m hopeful that Microsoft can perhaps improve the performance. There’s a history in the Surface line of Microsoft releasing updates that fix some of the biggest problems; I hope the Surface Go is no different. Because as much as I want to recommend it unabashedly, even my limited experience has shown this to be a real problem. Oh, and if you care, the screen has a thick bezel around it. It doesn’t bug me much, but it might bother you.